Antoine Fuqua directs this modern take on the classic 1960s Western. With the small town of Rose Creek under seige from the evil, corrupt businessman Bartholomew Bogue (Peter Sarsgaard), the residents seek the help of bounty hunter Sam Chisolm (Denzel Washington) to fight and help save their town. 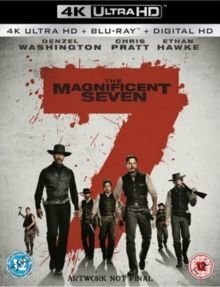 Joined by six other loyal men - gambler Josh Farraday (Chris Pratt), shooter Goodnight Robicheaux (Ethan Hawke), tracker Jack Horne (Vincent D'Onofrio), assassin Billy Rocks (Byung-hun Lee), warrior Red Harvest (Martin Sensmeier) and outlaw Vasquez (Manuel Garcia-Rulfo) - Chisolm sets a plan in motion to defend the lives of the good people of Rose Creek.